Riley Wurtz (1) on fast break with Jess Lynch (10) just about to get a pass for a layup. 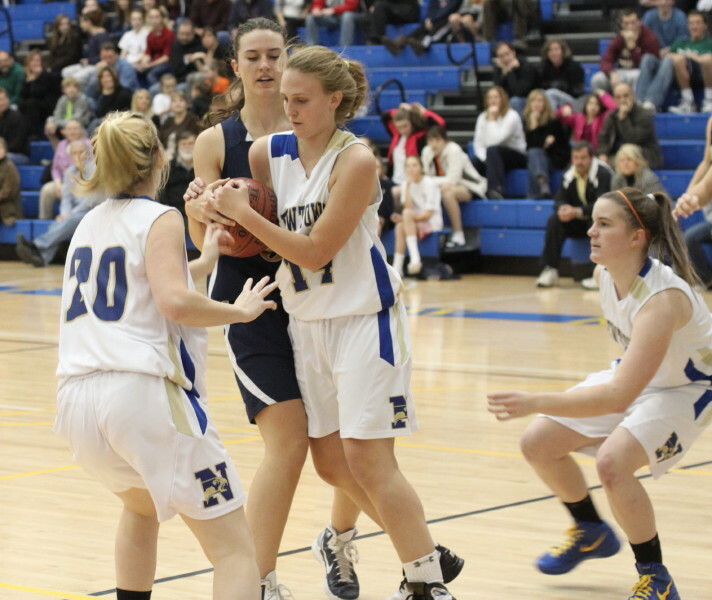 Cassie Ekstrom (5) puts some defense on Morgan Moubayed. 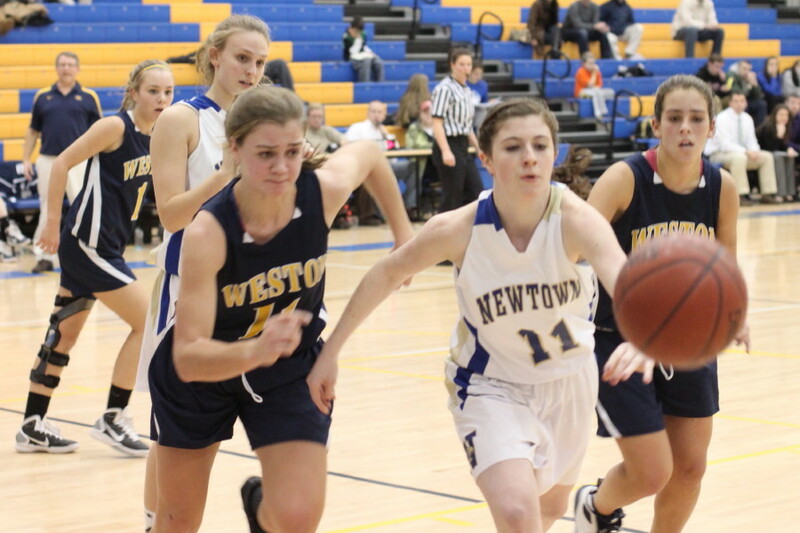 (Newtown) Undefeated Newtown (4-0) overwhelmed winless Weston (0-3), 68-45, in nonleague girls action at Newtown High School on Tuesday night. The twenty-three point margin doesn’t begin to tell the story of how one-sided this game was. No sign of the Hawk starters after the third quarter – they were ahead, 59-27. From the start you could see that the Newtown full-court pressure was going to be trouble for the visitors. That pressure seems to work best in the half-court and every turnover (25+?) became a fast break in the other direction. 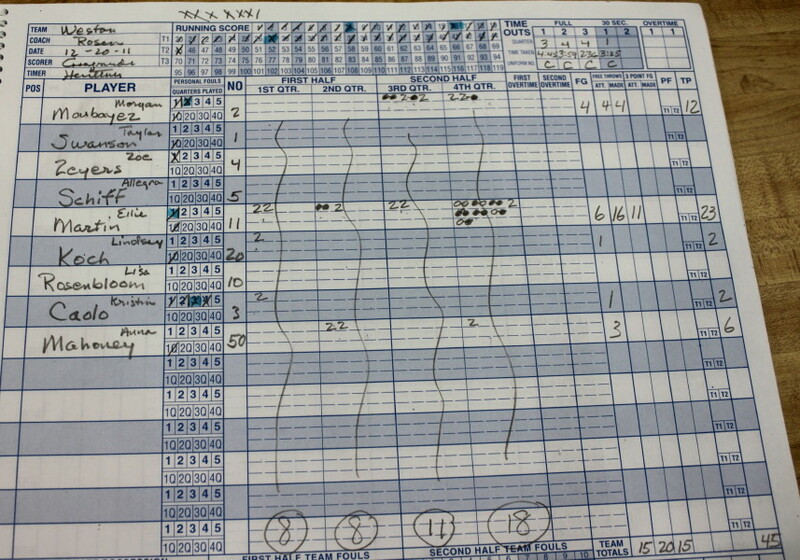 Riley Wurtz (7 points) shot poorly but more than made up for it with steals and assists. 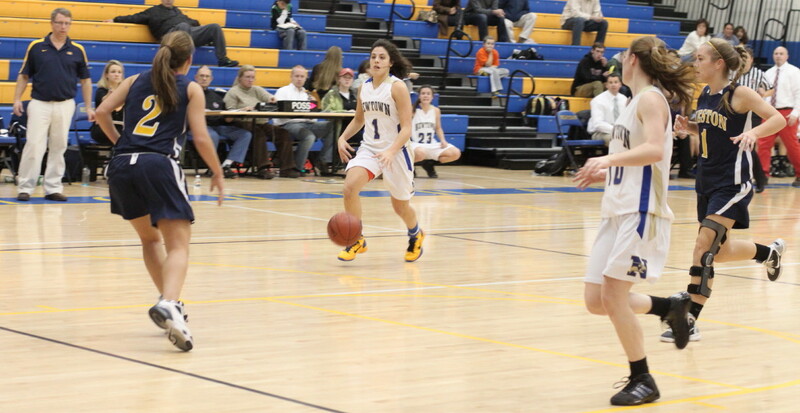 Jess Lynch (17 points) was on the breakaway end after many of the Lady Trojan giveaways. Riley Wurtz (7 points) on clean break away. Another successful Hawk maneuver was an instant answer to every Weston basket. 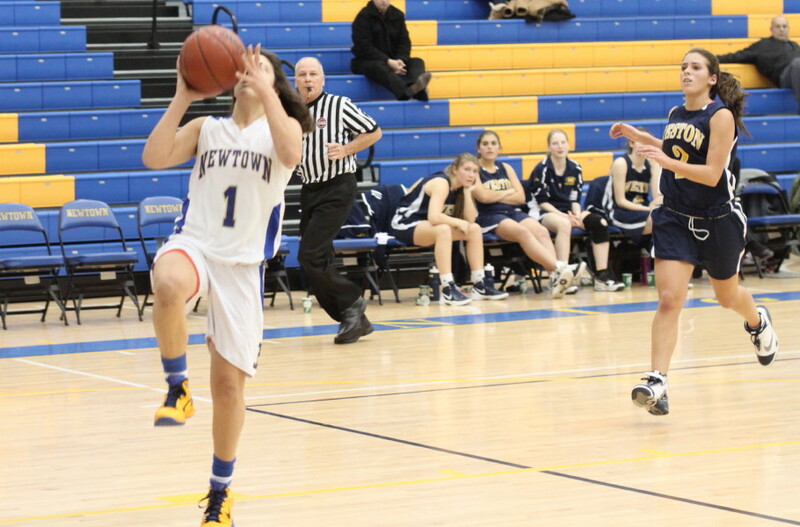 Newtown had several long-pass layups after baskets. 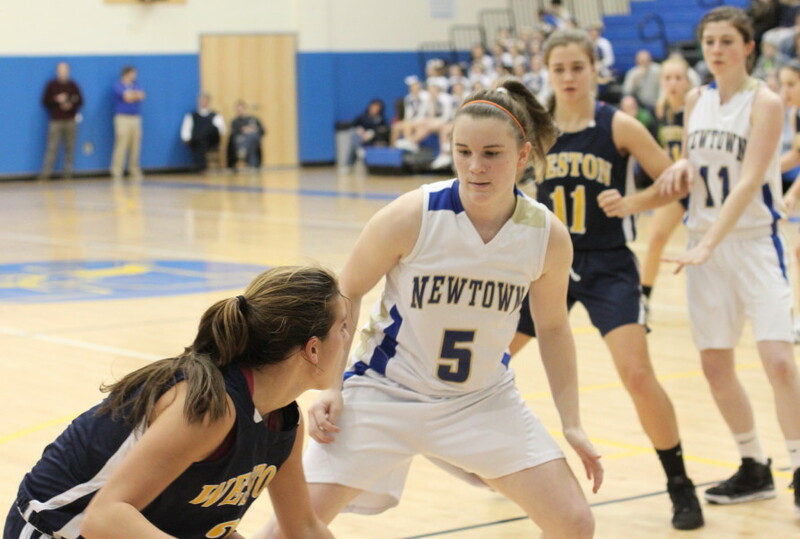 Newtown jumped out to a quick, 7-0, start with a Bridget Power three at the end of it. Weston responded with three baskets led by Ellie Martin and the score was, 11-6, with three minutes left in the first period. 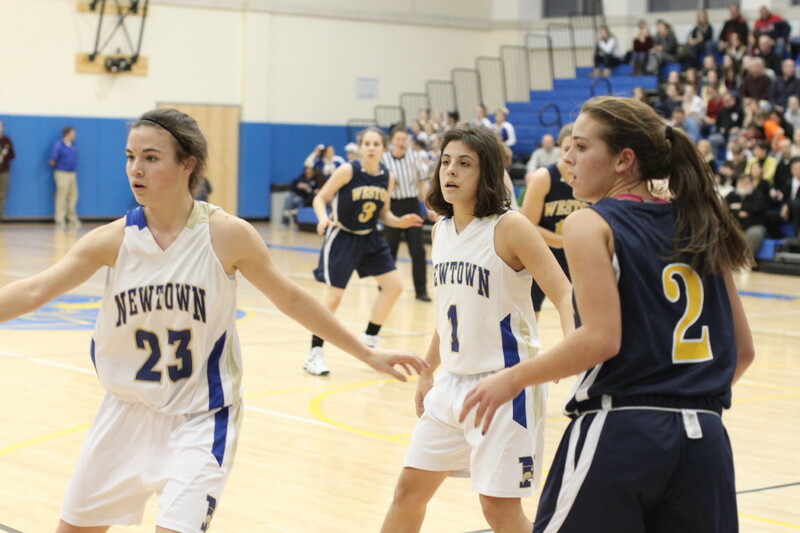 The next fifteen minutes of playing time, stretching through four minutes of the third quarter were all Newtown. 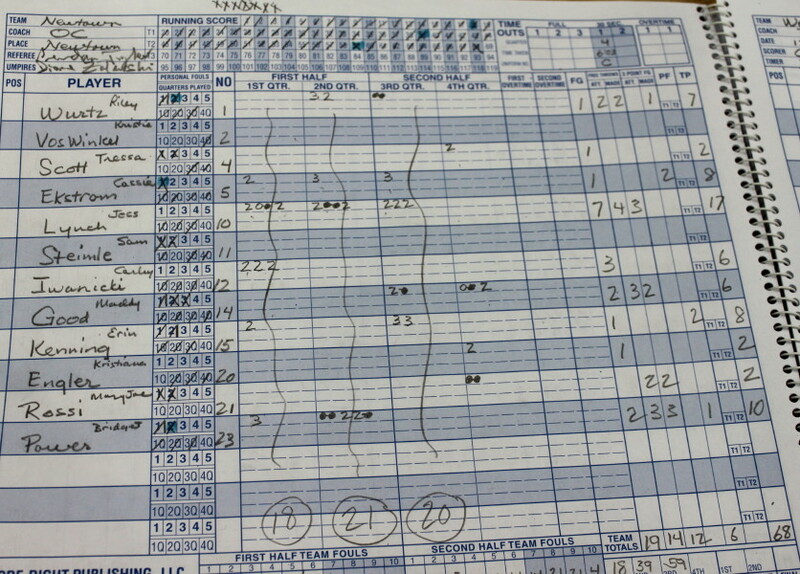 They outscored the visitors, 42-10! Jess Lynch had fifteen points during the big run. Weston had just three bench players and early on it was clear that keeping up with the non-stop Hawks was going to wear down the Lady Trojans. Fortunately, NHS coach Jeremy O’Connell used reserves early and often and they weren’t quite as adept at creating the turnovers and getting breakaways. With the NHS starters on the bench, Ellie Martin (23 points) had a nice final quarter getting Weston’s last eleven points. First look at Newtown’s basketball setup. Terrific lighting. I was on hand for the Newtown/Masuk football game. Less said about that, I suppose, the better. Cheerleaders were impressive. They were so good that I didn’t worry about them falling. 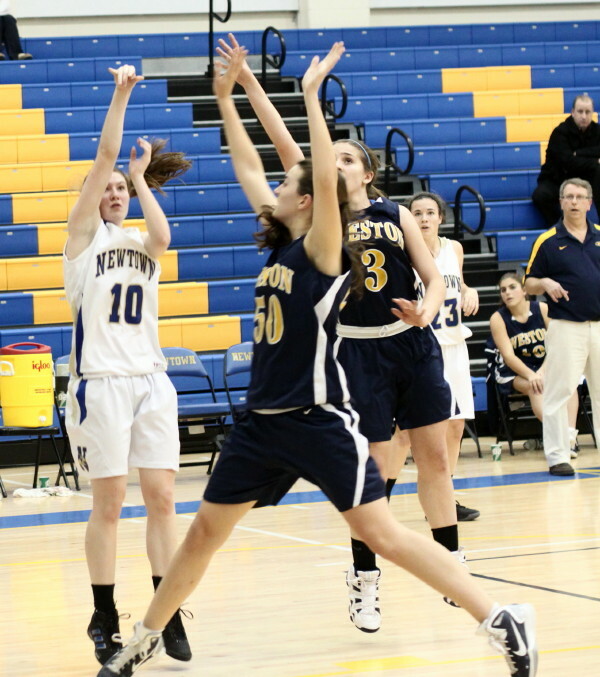 This was Newtown’s home opener. No programs??? If you click on the pictures they enlarge to normal size.